At Tesco, we foster an environment of openness and collaboration to leverage from the diversity, knowledge and experience of our colleagues. Our employment decisions are fair, transparent and underline our intent to offer equal opportunity to all. With inclusion at the core of our approach, Tesco has a special focus on women colleagues and is instrumental in enabling them to build great careers at Tesco. 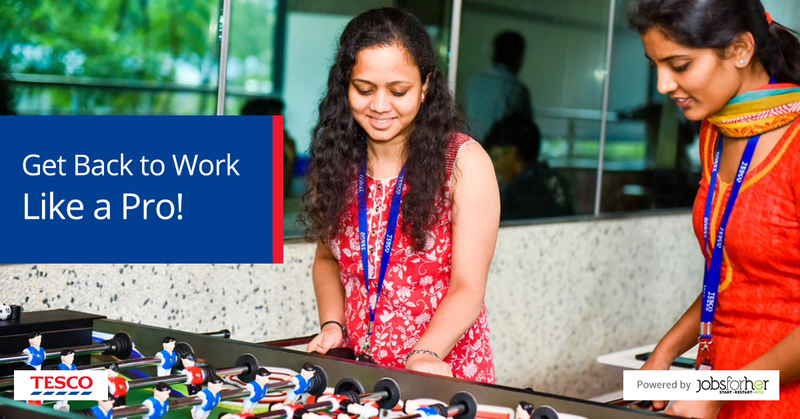 At Tesco technology, we lay great emphasis in hiring women and are committed to provide them with opportunities that will help them learn and grow as thorough retail technology professionals. We run focused initiatives that aim to train, mentor and coach women colleagues and our endeavour is to help them through every stage of their professional journeys. With this commitment, we are introducing – SecondInnings, an initiative that aims to help women technology professionals to restart their careers after a break. This is a hiring effort where potential women candidates will have to go through a robust evaluation process and the chosen ones will get the opportunity to work with the technology team at Tesco. As part of this programme, we are organising an event on 11 April 2019, at the Tesco main campus in Whitefield where we wish to meet all the interested women technologists. So what are you waiting for? Here is the chance to get back to work like a pro! With 3- 9 years of experience. With a career break of minimum 1 year.